Leftist South Korean President Moon Jae-in’s top officials claimed on Thursday that Pope Francis was interested in visiting North Korea following a meeting between the head of the Catholic church and the head of state at the Vatican. Moon, a Catholic, has repeatedly suggested the Vatican take a role in mediating between North and South Korea and North Korea and the United States, despite the extreme persecution of Christians in that country. While North Korea was once considered one of the top Christian population hubs in the world, the repressive communist Kim regime severely punishes worship or even exposure to the teaching of Jesus Christ, forcing the few remaining Christians to practice their religion underground. Pope Francis has made visits to repressive communist states like Cuba during his tenure, but no pope has visited North Korea since the Kim dynasty conquered it. South Korean officials told reporters that they received Vatican permission to discuss the details of Pope Francis’s interest in the invitation. “The pope said ‘(I) will unconditionally give an answer if an (official) invitation arrives and I can go’,” Yoon Young-chan, a top secretary to Moon, reportedly said following the meeting, according to the South Korean news outlet Yonhap. Moon reportedly asked the pope whether he could request to dictator Kim Jong-un to send a formal invitation to Pope Francis to enter the country. “The pope said the verbal invitation relayed by President Moon should be sufficient but that an official invitation would also be nice,” Yonhap reports Yoon said. 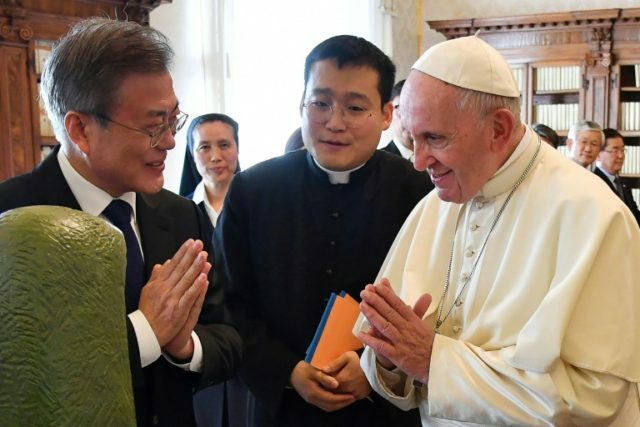 JoongAng Ilbo, a South Korean publication, reported that Moon spent about an hour with Pope Francis and interpreters in a meeting where recording was prohibited. Prior to that, the Vatican wholeheartedly welcomed his visit. “I welcome President Moon Jae-in and first lady Kim Jung-sook. I deliver blessings from Pope Francis. I now pray for the peace on the Korean Peninsula. After so many years of tensions and division, the word ‘peace’ can ring out fully,” Cardinal Pietro Parolin said in a mass to welcome the first couple on Wednesday. Moon, who is both Catholic and the son of North Korean refugees, has spent months promoting the idea of using the Vatican as an intermediary to bring the Korean War to an end. Moon requested papal intervention in June 2017 and reportedly suggested to Kim Jong-un during his most recent meeting with the dictator to consider allowing Pope Francis into the country. This month, the Blue House, Moon’s presidential office, said that Kim had responded “enthusiastically” to the idea of allowing the pope to visit. JoongAng Ilbo suggested that the Vatican could use such an invitation to bring up the matter of human rights in North Korea. Yet Pope Francis’s visit to another communist country, Cuba, suggests that he is more likely to avoid the matter than address it directly. During his Cuba visit in 2015, Pope Francis was caught on video witnessing the brutal beating an arrest of Zaqueo Báez, a pro-democracy dissident. Báez had yelled the word “freedom” near the papal caravan, prompting the beating. Pope Francis later indicated he had no knowledge of the imprisonment of Cuban dissidents and instead argued that Europe should address its own human rights problems, without naming them. North Korea, once home to thousands of churches and nicknamed “the Jerusalem of the East” for its Christian population, now displays Bibles as weapons in its museums and regularly imprisons and kills believers. One Christian church legally exists in North Korea: the Korean Christian Federation, which has no known organic membership and, according to visitors to the country, exists solely as a propaganda vehicle for the government. North Korea also keeps “show churches” maintained for tourists and foreign visitors generally that North Korean citizens cannot use for prayer. Similarly, North Korea has allowed Christian leaders to visit in the past – most notably the Reverend Billy Graham – but later used their visits to promote worship of the Kim family. North Korean defectors have stated that the country shows a greater hatred of Christianity than almost any other religion or ideology. Thae Yong-ho, a high-profile defector in South Korea, told reporters this year that Christianity is what the Kim regime fears the most. “Kim Il-sung came from a Christian family, so they know how the religion works. They know that Christianity would hamper the Kim family’s dynastic succession to power,” Thae noted.